We are now available at Decor & Pour in Canton! 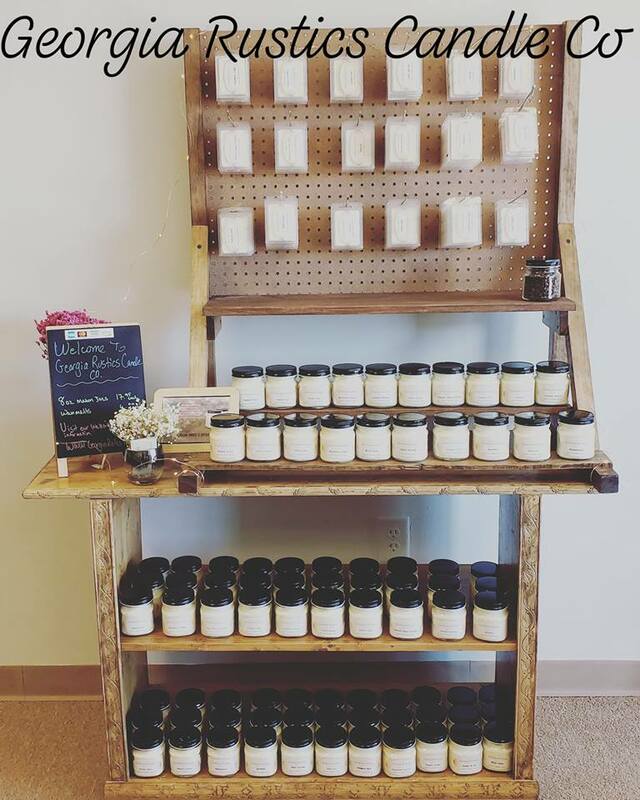 We're thrilled to announce that Georgia Rustics candles and melts are available at Decor & Pour in Canton. If you haven't been there you REALLY need to check 'em out.. it's is a paint n sip farmhouse paint studio and is located at 110 Prominence Point Pkwy #100 in Canton, Georgia.. Right next door to Publix. Spring is just around the corner and we've been busy getting ready! We'll be updating the website with the new spring scents over the next couple of weeks, so keep an eye out. Also, spring means the farmers markets are starting up here in the mountains! We'll be setup at a couple of different locations in the area this year and we'll post those in the upcoming events calendar as well as on this updates page so check back often and come on out and say Hi, we'd love to meet you! Members: Thanks to all who have signed up on the website! We're going to be starting our monthly email newsletter soon.. this will go out to all of the registered members. It will contain all sorts of information on the candles, new scents, local farmers markets.. etc.... but most importantly we'll be offering specials (flash sales, free samples..) to all registered members! So if you haven't signed up yet hurry and sign up now so you don't miss out! Lots of fun stuff coming!!! ​ We would like to welcome all of the NGHBC teachers, students, friends and family. We're excited to be working with you on your current fundraising event! For those of you unfamiliar with this organization, North Georgia Homeschool Band & Choir (NGHBC) is a Christian, non-profit organization founded in 2007 and overseen by a volunteer board of directors. NGHBC is dedicated to offering high quality, music education to homeschool families at an affordable cost. Classes are open to all homeschooled children, preschool through high school, and their parents. NGHBC members are currently selling Georgia Rustics candles as part of their fundraising efforts. This is a great organization providing a wonderful and vital service to the Homeschool community. Come on out and say hi this weekend! We're going to be at the Holiday Stop n' Shop hosted by the Frosty Frog Creamery in Canton this Saturday from noon until 4:00.. Come on out and say hello, we'd love to see you! Holiday market in jasper, ga was a blast!!! We had a great time this weekend meeting all of our customers, old and new.. and hanging out with the other vendors at the holiday market. This years market was bigger and better than ever, with over seventy different vendors from all over, and hundreds of shoppers. This year we were shocked and incredibly honored to have been chosen for the "Best in Show" award! We are humbled to have been given this award as it is based on votes cast by our fellow vendors at the show. This is a group of incredibly talented and gifted people, many of whom have been so gracious and inspirational as we have slowly grown our business. 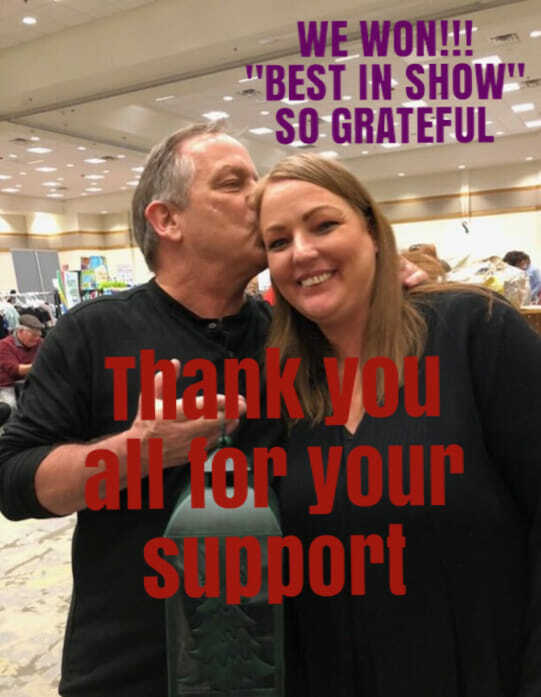 Thank's to all that contributed your time and energy into helping us have a successful market, and thank you to all that shopped with us, we hope that you love our candles as much as we do! We can't wait to be back next year! Come out and see us this weekend at the annual Jasper holiday market! We'll have all of the new holiday scents, along with gift baskets AND show special deals.. We'd love to see you there! ​Doors open Friday the 16th at 4:30 until 8:00 p.m. and includes. include food, drinks and entertainment as well as shopping.. tickets for Friday night are $25.00. Shopping continues Saturday the 17th from 9:00 a.m. to 4 p.m. and the donation is $1.00 at the door. The website if finally live! All of our current candles and scents are available on the site. We will continue to expand with exciting new candles as well as support for our wholesale customers.... so check back often. Keep checking the events calendar for all the holiday events and markets. We will be offering show specials so stop by and say hi!